I love crossword puzzles, and Natalie has been interested in doing them too. While browsing around on Amazon, I came across a couple of books called Kids Across, Parents Down . 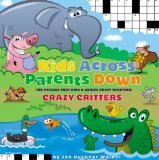 It is basically a book of kid-friendly crosswords where the across clues can be answered by kids and the down clues are a little trickier for parents. I ordered the Crazy Critters one for us to try out (the other book’s theme is On the Go ). We love it! It is such a fun activity for us to do together. The puzzles increase in difficulty as you work through the book, and we love the animal themes. The girls think it’s super-cool when they can answer one of the parent clues. We’ll definitely be ordering the other one – I hope they make more! Tip of the day: For more crossword fun, you can input your own set of words and clues at Discovery Education’s Puzzlemaker site. I’m planning to make Natalie a Valentine’s Day one this week! Do you know of any other sources for simple kid-friendly crossword puzzles? Please share if you do! Thanks! These look great. We have been enjoying the Scrabble crossword puzzles that we got for Christmas. I think I will pick up a copy of these for when we finish this book. I have this book! My daughter and I love to do it together.